All PCM IBCs are UN performance tested and certified for the carriage of dangerous goods. 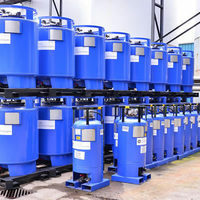 PCM IBCs are manufactured to withstand application and release of internal pressure of up to 3 BAR throughout their service life. The application of internal pressure enables the rapid discharge of container contents. 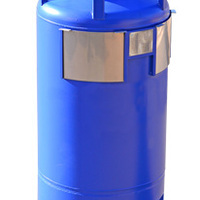 The PCM 250 is a reusable IBC designed for the transportation, storage and pressure discharge of hazardous liquids. 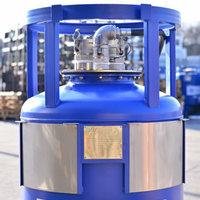 The pressure discharge method is highly cost effective; containers are not left with customers. Instead a unit on average can achieve 3 deliveries a week. The container also comes with a “Safety Air Feed”. 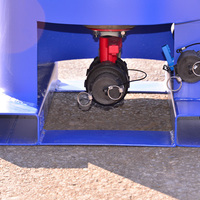 The SAF enables delivery personnel to discharge the IBC quickly and effectively, whilst safely standing on the ground. 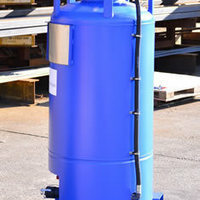 The cylindrical tank body, manufactured from mild steel, is inherently much stronger than square tanks with no crevices and is therefore easy to clean down. The tank body can be painted to provide resistance to the external environment. The integral pallet base has two way fork truck and pallet truck entry to improve handling efficiency. The tank inlet which is 250mm in diameter has a Stainless steel lid secured by 12 bolts. It is fitted with a EPDM³ seal, 1 x 1.5” SS¹ cam lock and safety air feed, 1 x 2” SS¹ Vent assembly and 1 x 3” SS cam lock and dustcap for cleaning and filling. The outlet consists of a 50mm threaded outlet pipe in HDPE⁴ from the tank body to a 50mm GRPP⁵ lockable ball valve, fitted with EPDM³ seals and terminating in a 38mm integral camlock adaptor complete with dustcap. 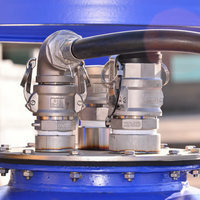 The dustcap is attached to the valve by a retaining cable. Please complete the form below if you would like to enquire about the PCM 250.